The global number of email users has reached 3.8 billion in 2018, sending and receiving a total of 281 billion emails every day. While the prevalence and growth of email can seem almost overwhelming; the more things change, the more they stay the same. The Radicati Group—who produce an annual survey on global email adoption—state that despite other communication technologies like social networking, instant messaging, mobile IM, and others, are taking hold, email remains “the most ubiquitous form of business communication”. In short, both the business and consumer worlds are sending and receiving more emails than ever. And on the business side, many of those emails contain vital pieces of information, making them documents of record. Presently, however, emails and the business-critical information are not thought of as documents of record. Finding and accessing important information is very difficult when it is hidden in walls of prose in lengthy email chains. Yet the solution for this problem goes too far in the opposite direction. Those working with Microsoft business solutions, for example, have emails stored in Exchange, while documents are managed in SharePoint. This leads to the ‘Exchange-SharePoint gap', which creates an information disconnect and leaves end-users struggling to overcome information silos. Our new eBook: “Mind the gap: A better way to manage emails in SharePoint” details the underlying problems with email management and the steps you can take to improve the process in your business. Download your copy now to find out more. In the modern workplace, there are more mediums for communication than ever. Instant messaging platforms like Microsoft Teams and Slack have proliferated in the workplace, while video conferencing allows workers in different corners of the globe to attend the same meeting. But despite the many options, email remains at the center of enterprise communications. harmon.ie conducted a survey of over 1,000 business professionals to find out which Office 365 apps were used the most by knowledge workers. 75% of respondents said email was in the top three of their most-used apps. As a platform for communication, then, email is performing as well as ever. The difficulty organizations face, is extracting important information from emails and storing it in the correct manner, so employees can access that information when they need it. 80% of an organization’s 'documents of record' are emails – but you can’t manage your emails in SharePoint. This creates a serious problem. When emails are stored in Exchange, this important information is stored in a user’s personal inbox and isolated from the rest of the organization. This makes the process of email management—from retention to compliance, auditing, discovery, etc.—considerably more difficult. Archiving – Outlook users can move old items they want to keep into a virtual archive. Search – quickly locate information within emails and in attachments through a search bar. Outlook rules – set up actions to be carried out on incoming or outgoing messages when predetermined criteria is met, to provide a degree of control over how emails are managed. For example: set a rule that automatically saves all emails that include the word ‘GDPR’ in a specific folder of your choice. Labels – identify different types of content as needing an action to take place, which can again be preconfigured. For example: retaining, deleting, or marking emails as a record so it cannot be edited or removed in the future. Although these Outlook capabilities do indeed offer users more control over their documents and data, they do not resolve the larger problem of disconnected information. With business, employee, or project-critical information still stuck in personal inboxes rather than in SharePoint, it cannot be accessed by the wider organization. Important emails will still be lost when employees leave the organization or go on leave. Compliance issues will remain if emails cannot be retrieved on demand. For better email management, employees need to be able to store, classify, and retrieve emails with ease—the same ease they have come to expect with more recognized documents of record like Excel spreadsheets, Word documents, and PDFs. 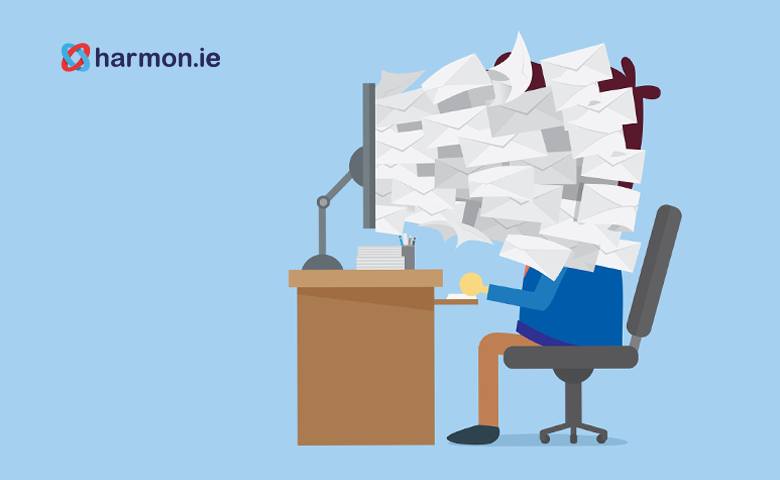 For knowledge workers that spend their day working with Outlook email management, harmon.ie provides all the capabilities they need to bridge the information gap between Outlook (the primary source of communication and information) with SharePoint (the platform they use to manage information and keep it safe). Discover: Context-sensitive search for SharePoint content directly from the Outlook window. Comprehensive filters, views, and favorite capabilities to quickly find information. Share: Collaborate with colleagues by sending them secure links to SharePoint content in Outlook, Teams, Skype for Business, or Yammer. For all the benefits to email management harmon.ie can offer, download “Mind the gap: A better way to manage emails in SharePoint” today!